The Pink-necked Green Pigeon Treron vernans is the most common of the green pigeons in Borneo. It is found in gardens, coastal and secondary forests throughout South-east Asia. It moves around in small flocks, feeding on fruits and berries. Its colourful plumage allows it to blend into the greenery. It has been ages since I last posted anything on pigeons and doves. 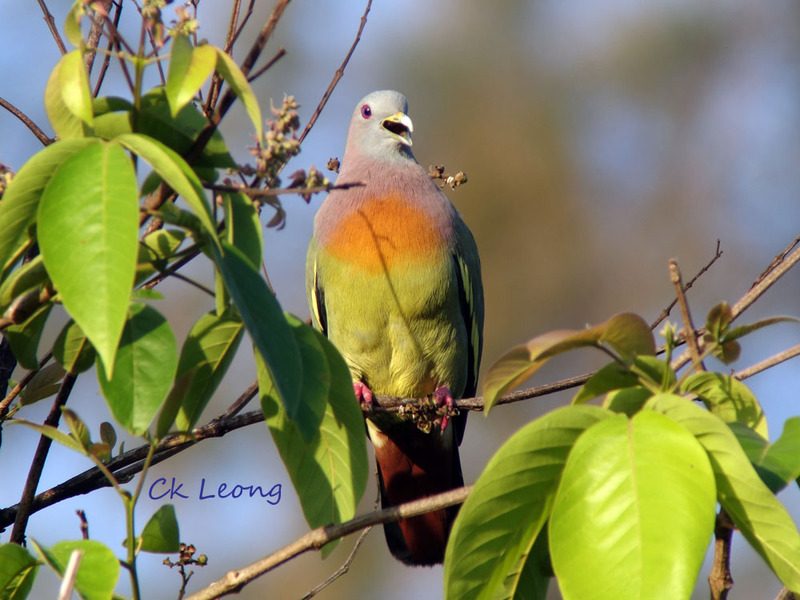 So here is an Emerald Dove Chalcophaps indica in an uncommon state of being perched on a bare branch. Usually it is walking on the ground while searching for food or it is flying fast and low, away from you. 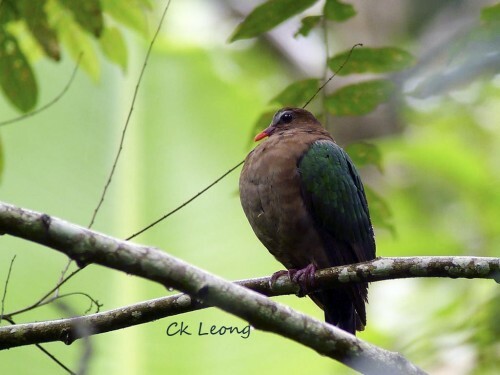 Over the last years, I have been having much more sightings of this bird and in a variety of habitat, from 1,800m on Mt Kinabalu down to the islands off Kota Kinabalu. Signs of an healthy population? 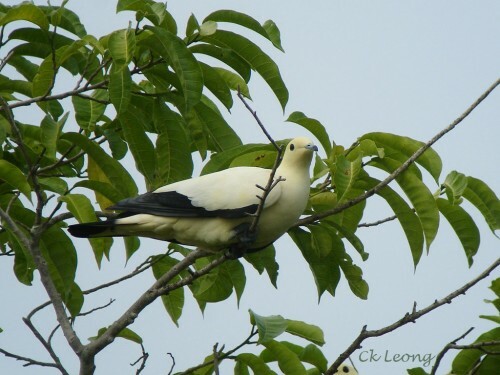 On a recent trip (with the Oundle School natural history trip to Borneo) to Lankayan Island off the north-east coast of Sabah, the Pied Imperial Pigeon Ducula bicolor was without doubt the standout of a rather short list of avian fauna there. This island inhabitant displays a creamy white head and body with black flight feathers and uppertail. It feeds on fruits and will migrate to other islands or coastal mainland in their search for food. I also saw a small flock of them on the beach picking on small pieces of broken coral. Here’s a common bird found in all kinds of habitat up to submontane forest. 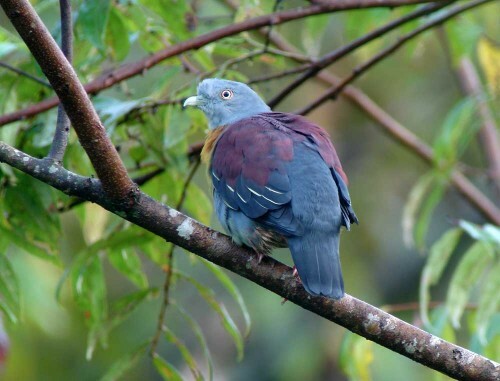 The Little Green Pigeon Treron olax moves around in small flocks, feeding on berries and figs. Sometimes one gets lucky when the bird comes down to feed on a low branch, affording great views as I did with this bird. I have to admit that I have difficulty distinguishing the calls of the different Treron pigeons but no matter, they all look good. 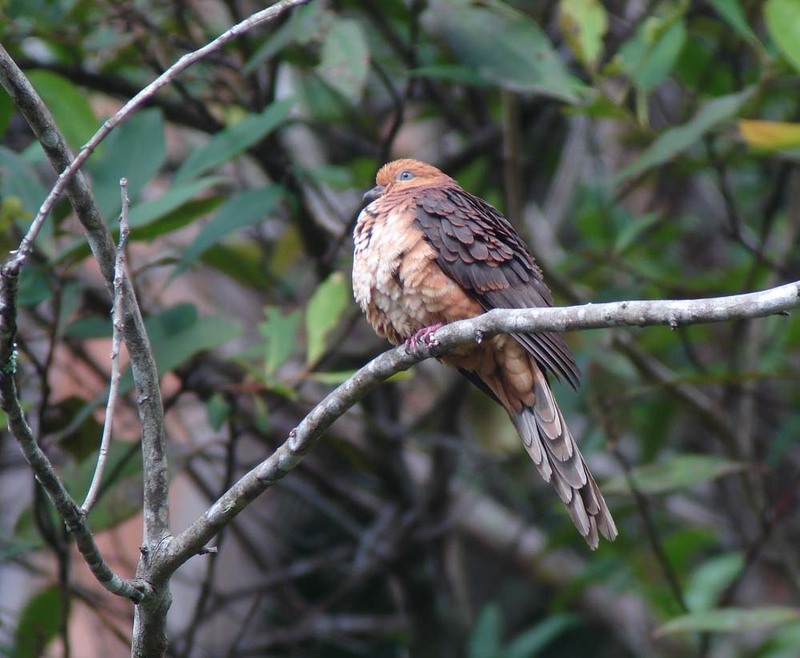 The Little Cuckoo-dove Macropygia ruficeps is a common resident of the montane forest of Borneo. It makes quick flights with its powerful wings and forages in mid-storey and canopy of flowering trees. At rest, it announces itself with a distinct and repeated wook wook. For the birder, there is a much higher chance of seeing it in flight than perched.